The J series is already home to some solid midrange smartphones and the Galaxy J7 is released to spice things up a bit. Samsung launched the J7 in 2016 to extend its already-solid Galaxy lineup. One of the most selling key features among the J series is their super cool AMOLED display and the Galaxy J7 is no different. It boasts a massive 5.5-inch Super AMOLED display for a better viewing experience and is elegantly designed for a more premium feel. The unibody design definitely makes it look like a premium segment smartphone. It’s looking to push the boundaries with its competitive features like better camera, better battery, and better everything. The Galaxy J7 launch was a wise strategy considering Samsung has arguably the widest network amongst smartphone makers around the world and with devices like J7, it’s showing no signs of slowing down anytime soon. Coming to performance, the J7 is powered by Samsung Exynos 1.5GHz octa-core processor for a blazing fast performance paired with 1.5GB of RAM. It packs a 13-megapixel rear camera which is capable of shooting 1080p HD videos at 30fps, plus a 5-megapixel front shooter for clicking cool selfies. It comes in two storage options: 8 and 16 GB which of course can be upgraded to 128GB had you need extra storage. The J7 Prime is a significant upgrade to the J series which definitely takes it to the next level, thanks to its high-tier IPS LCD display technology with 1080p resolution. Like its predecessor, it also has a 5.5-inch display but with a screen resolution of 1080 x 1920 and pixel density of 401 ppi. It comes built-in with an advanced 64-bit class SoC (system on a chip) and is powered by 1.6GHz octa-core Exynos chip backed with 3GB of RAM. The only thing that remains with the upgrade is the Exynos chip. The processing power hasn’t changed much, yet it’s able to manage twice as many pixels. Coming to camera, it also features a 13-megapixel primary camera but upgraded the front-facing camera to 8-megapixel from the J7’s 5-megapixel. Camera is definitely better in the J7 Prime, plus it has a better battery life owing to the 3300 mAh non-removable battery which is sure to last a day of mixed usage. There is no quick charging though. Unlike the J7, the Prime comes with 32GB of internal storage which of course can be expanded to 256GB for more storage. Running under the hood is the Android v6.01 which was then the most up-to-date Android version (upgradable to Android v7.0 Nougat). The Galaxy J7 boasts a 5.5-inch Super AMOLED display with capacitive touchscreen which definitely puts the phone under the premium segment. It has a screen resolution 720 x 1280 with a pixel density of 267 pixels per inch (ppi). The Galaxy J7 Prime, on the other hand, features a 5.5-inch Full HD IPS LCD display with a screen resolution of 1080 x 1920 and with pixel density of 401 ppi. While both J7 and J7 Prime pack a 13-megapixel primary camera on the back which is capable of recording 1080p high-resolution videos at 30fps, the J7 packs a 5-megapixel front shooter with LED flash for selfies and the J7 Prime has a 8-megepixel front-facing camera for snapping cool selfies. The Galaxy J7 is powered by Samsung Exynos 1.5GHz octa-core processor with 64-bit architecture and comes with 1.5GB of RAM under its hood. It also has a Mali-T720 MP2 graphics processor to improve graphics performance. The J7 Prime packs an Exynos 1.6GHz octa-core processor under its hood paired with 3GB of RAM and a Mali-T830 MP2 graphics processor. The Galaxy J7 comes built-in with 8GB and 16GB internal storage options which can be expandable up to 128GB via a microSD memory card for extra storage. The J7 Prime, on the other hand, comes built-in with 32GB of internal storage which can be expanded up to 256GB. 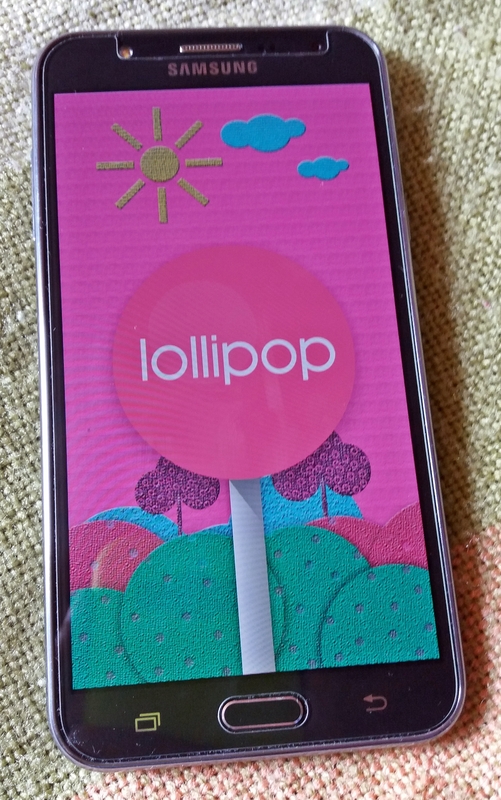 The Galaxy J7 was officially released with the Android v5.1 (Lollipop) which was further upgraded to the Android v6.0.1 (Marshmallow) as provided by the company through OTA. The J7 Prime comes with Android v7.0 (Nougat) support now after it was upgraded from its official Android v6.0.1 Marshmallow. Samsung have come a long way since it released its first Android smartphone in 2009 and presented the world with the first Android tablet back in 2010. It didn’t take much long for the company to regain its footing as the top market leader in the smartphone ecosystem. And with the launch of its J series of smartphones, Samsung regained control in the global smartphone market as a leader and it continues to do so with its extensive line of Galaxy series smartphones. The Galaxy J7 and J7 Prime are the latest addition to their already solid lineup. The J series is definitely one of the largest selling smartphone range in the world. This article shows how the two stand up to each other. Sagar Khillar. 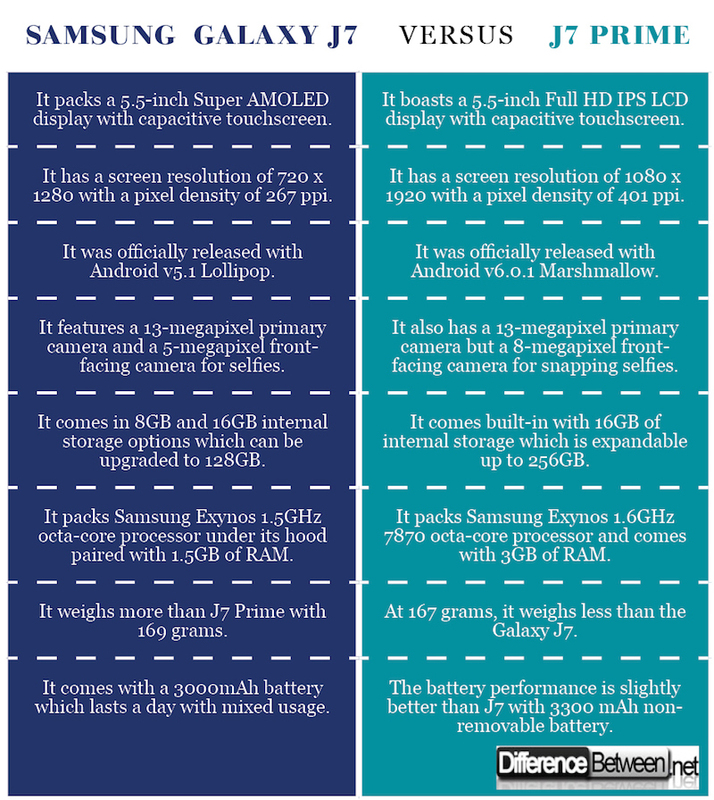 "Difference Between Samsung Galaxy J7 and Galaxy J7 Prime." DifferenceBetween.net. February 20, 2018 < http://www.differencebetween.net/object/gadgets-object/difference-between-samsung-galaxy-j7-and-galaxy-j7-prime/ >.